Interested in a Lesson or Clinic? Scenic Farms Golf Course Partners with Lee Ferrec to Provide you with Lessons and Clinics to improve your Golf Game! Learn the game of golf with Lee Ferrec at Scenic Farms Golf Course. All lessons are scheduled directly with Lee Ferrec. Interested in a Lesson? Our wonderful instructor Lee handles all of his own scheduling. You can schedule a lesson directly through his website or contact him directly. Lee’s integrated teaching philosophy focuses on evaluating each student’s strengths and designing a plan based on what the students want to achieve and their abilities. Payment of $175.00 for the 5 week program is due in advance before classes begin. If spots are available, late enrollment will be accepted. The week of June 24 will be used as rain date. Refunds will only be awarded if Lee is unable to attend do to weather or personal reasons, but NOT if a student can not attend. The group will have a minimum of 3 and maximum of 5 students. Additional groups can be accommodated in other time slots if 3 or more attend. For additional information or to REGISTER, please text Lee at 845-642-3332 or email him at Lee@LeeFerrec.com. such as sportsmanship, respect, and honesty while building confidence in their abilities. The camp is from 9—11 each morning, Tuesday through Friday, July 9—12. Payment of $175.00 for the 1 week camp is due in advance. If spots are available, late enrollment will be accepted. Lee Ferrec offers a five-week program for both the new junior golfer, as well as, the intermediate level junior golfer. 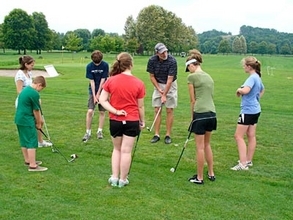 The emphasis is always on having fun but offers the opportunity for junior golfers to improve their technical abilities along with developing on-course management skills. Ages 6—9 meet Tuesday morning at 9AM. Ages 10—13 meet Tuesday morning at 10 AM. Payment of $150.00 for the 5 week program is due in advance before classes begin. If spots are available, late enrollment will be accepted. The week of August 27 will be used as a rain date. Refunds will only be awarded if instructor is unable to attend due to weather or personal reasons, but NOT if a student cannot attend.